Matthew is my book loving kid. He's the kid I bond with over new book series and trips to the bookstore. I love to watch him devour a book with the same excitement I feel when I have a new book to read. He's my kid who will stay up way past his bedtime because he has just one more chapter (or three) that he needs to finish and can't stand to put the book down. And I lecture him about how he can't stay up late on school nights but inside I totally get his excitement. These days Matthew's favorite author is Brandon Mull. He wrote the Fablehaven series, which Matthew read a while back, and he has also written a series called The Beyonders that Matthew just went crazy for, and he just came out with the first book in a new series that Matthew read pretty much the first day it was released. He talks about Brandon Mull all the time. 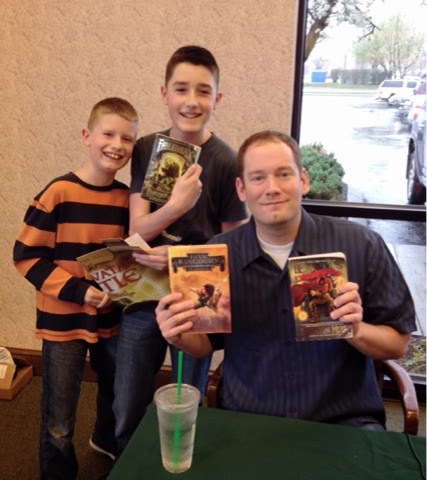 We have had many conversations where he tells me all the reasons why Brandon Mull is the best author ever. So after one of those conversations a few weeks ago, we decided to look up Brandon Mulls website together. And on that website was a list of tour dates. And on that list was the Barnes and Noble in our town. And Matthew freaked out. The chance to meet Brandon Mull in person? Better than Disneyland. So he has been waiting weeks for the big day to arrive. And that day was today. The event was at 6:00 this evening but I knew it was going to be packed and I knew how much Matthew really wanted to be front and center to see him speak, so Josh and I picked him up at the bus stop after school and we got to the bookstore at 4:30 to get a good seat. When you show up an hour and a half early for an author meet and greet at Barnes and Noble, you end up bonding with a group of super ultra book nerds who also showed up an hour and a half early for an author meet and greet. There were the three of us, a middle school special ed teacher, a young guy who apparently knows everything there is to know about a sci-fi novels and will tell you whether you ask or not, and a hipster looking girl who was supposed to meet someone there but they didn't show so she sat next to the sci-fi guy and I totally think they should go out, because, come on, they both showed up an hour and a half early for an author meet and greet at the bookstore. This is who we bonded with in the front row for the hour and a half before the event started. I don't know, but I'm pretty sure me and the special ed teacher are best friends now. They both spoke for a short time and then took questions and then signed books. They were really funny and interesting to listen to. They did not make it very well known ahead of time, but they've been handing out tickets for your place in line at the book signing. You get a number and that's your place in line. First come, first serve. I got smart and called the book store a week ago and found that out and picked up a ticket in advance so we had a low number and good place in line. Most people didn't realize that there were tickets until tonight and it was a looong line. So we had front row seats for the discussion and a good place in line for the signing and we were in and out in a reasonable amount of time. I love it when that happens. I would not have wanted to be at the end of that line. Seeing the event through Matthew's eyes was really fun. He was a little star struck and just SO excited! He took some of his books from home to get signed and he was really excited to get to talk to Brandon Mull for a minute. He gushed over his books like a true superfan. :) It was a really fun evening and I'm glad we got to do it. My 10 yr old son has read all his books too:) how fun! Hi Meeting Mathew's Idol, I wanted to let you know about my campaign: 'The Voices of Korean Adoption'. After reading your blog it seems that our intentions to help, heal and grow together are similar. This campaign is a Kickstarter, and we're about 10 days in. I'd really appreciate a share through your social networks, as well as donations or a featured blog post - whatever you can afford. Details are in the attached/copied press release. Thank you - and thank you for being brave and sharing your story. It is important. SEATTLE, WA and SEOUL, SOUTH KOREA – April 03, 2014 – Laura Wachs, established performance artist and community organizer, is excited to announce ‘The Voices of Korean Adoption’. This powerful art project will raise money to benefit Korean adoption agencies GOAL and KoRoot, through a performance poetry showcase. The showcase will feature poets from around the world who were adopted from Korea. The art project arose out of Wachs’ own journey to reunite with her biological parents. Wachs is awaiting confirmation from an agency helping her locate and meet them. 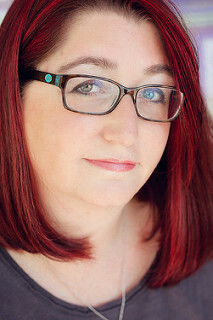 Meanwhile, she plans to tell the world about the uniquely intricate experience of adoptees through several means: the above-mentioned poetry showcase, a book of poems from Korean adoptees all over the world, a book of poems presenting Wachs’ own journey, and a series of poetry workshops. Wachs is running a Kickstarter campaign to support the project. The campaign has thus far raised over 30% of the $10,000 goal, with more than three weeks remaining. Visit “The Voices of Korean Adoption” on Kickstarter (link: https://www.kickstarter.com/projects/2057364396/the-voices-of-korean-adoption ) to help tell these incredible stories. To learn more about the heart behind the project, or for additional information about the crowdfunding campaign, contact Laura Wachs at laura_wachs@hotmail.com.